If you really like coconut cream pie, like I do, then you'll love this cake. This recipe has seven-minute frosting on it, but you can always substitute any type that you might prefer. 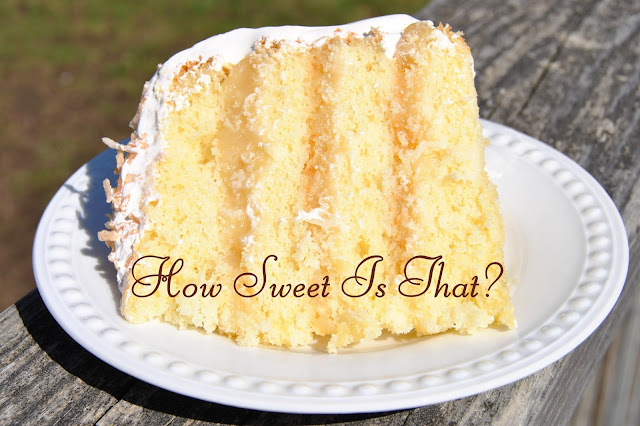 The recipe can also easily be halved to make a smaller 6-inch layer cake. Grease two 9-inch round cake pans. Preheat oven to 350 degrees F.
In a small bowl, cream the sugar, shortening and butter until light and fluffy. Beat in eggs and yolks. Add vanilla. Combine the flour, baking powder and salt; add to the creamed mixture alternately with milk. Beat until just combined. Pour into prepared cake pans. Bake for 25 to 30 minutes or until a toothpick comes out clean. Cool for 10 minutes; remove from pans to wire racks. Cool completely. Bring corn syrup to a boil. Beat egg whites until stiff, but moist peaks. Gradually beat in hot syrup. Continue beating until very stiff and shiny, about 5 to 7 minutes. Beat in vanilla. In a bowl, whisk the milk, extract and measured pudding mix for 2 minutes. Let stand for 2 minutes or until soft-set. Finely chop 1/2 cup coconut, fold into pudding mix. Split each cake into two horizontal layers. Spread a third of the pudding over one cake layer; repeat with layers twice. Top with remaining cake. Frost the top and the sides. Toast remaining 1/4 cup of coconut (6 minutes in 350 degree oven); sprinkle over the top. Store in the refrigerator.